Ever wonder what inspired people to fly through the air in a balloon? You’re not alone! Here’s a short course on hot air balloon history and its pioneers! People have been taking to the skies in hot air balloons for more than 200 years. And balloon popularity seems to be skyrocketing. With balloons going up all over the world for festivals, private rides, and entertainment, they’re as relevant as ever. But did you ever wonder how these flying balloons came to be? Wonder no more with this short course on hot air balloon history! There are reports throughout history of people using hot air to send balloons into the sky. 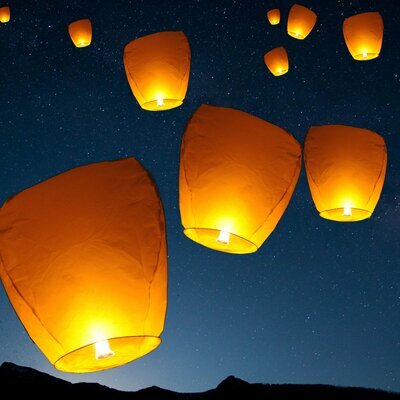 Some of the oldest “hot air balloons” were actually called “sky lanterns” by the Chinese. These paper and bamboo lanterns first took to the skies in the third century BC, making them the first type of object to take to the skies via hot air. Another chapter of early hot air balloon history suggests that Nazca Native Americans from Peru were some of the first to use hot air balloons around 700 BC. Later claims suggest that a small hot air balloon was created by a priest in Portugal named Batholomeu Laurenco de Gasmao in the early 1700s. Russia also claims that a man named Kria Kutnoi flew a small balloon propelled by hot air in the 1730s. Each of these examples demonstrates an early understanding of using hot air to levitate balloon-like objects. However, none of these early examples of hot air balloons were manned or carrying any cargo. That’s where the Montgolfier brothers come in. Jacques and Joseph were living in the South of France working as paper manufacturers when they noticed something interesting. They noticed that when they burned paper, bits of the paper and ash would be levitated in the air by the flames. While this was actually because of the heat created by the flames, they believed that the fire and smoke created a magic power that could make things float. They decided to use this power to create something that could fly into the air, thus setting out to create what would be the first true hot air balloons. They created the balloon to capture the heat created, causing the balloon and basket to lift into the air. To create the heat necessary for flight, the brothers burned a combination of paper, wool, and manure. Good thing we’ve made advancements since then! On June 4th, 1973 they launched their first large balloon into the air for an 8-minute flight before it landed safely. Well, it was safe until local workers attacked and destroyed the “falling moon” that fell from the sky. After their success with that flight, the brothers decided it was time to send a balloon into the air carrying passengers. However, for fear of injury or death, they didn’t send any people up a first. The first aerial flight was taken by a duck, a rooster, and a sheep. The flight was performed in front of King Louis XVI, Marie Antoinette, and a large crowd at Versailles. This 10-minute flight was also successful, and the animals landed safely. Once the animal-manned flight was completed, they decided it was time to send people to the skies. The first-ever manned flight in hot air balloon history was on November 21st, 1783 in front of a huge crowd in Paris. It’s thought the entire city’s population of 400,000 people were in attendance to watch the first people fly. The balloon went up to around 500 ft and flew for around 25 minutes. It landed safely in nearby fields. Unfortunately, a large, strange-looking contraption landing in a farmer’s vineyard scared the local farmers. They charged at it with weapons, which caused Rozier and Laurent to panic. In order to stop the farmers from destroying the balloon and harming them, they supposedly promised each of them a fine bottle of champagne. Thus began the tradition of drinking champagne after a hot air balloon flight. These first adventures in aerial flight caused quite a stir around the world. The technology of aviation and hot air balloons was quickly developed. People didn’t have to burn manure and old shoes to take flight anymore; people discovered how to use other fuels, like hydrogen and propane, to fly hot air balloons. As the technology improved, the balloons became more grandiose. They were used for entertainment to perform shows and stunts. Some were created to lift people into the air on a throne. Hot air balloons were even used in warfare, the first time by the French in 1794. People also began to test the limits of balloon technology. They would fly long distances, climb greater heights, and bring more people up in the air. Jean Pierre Blanchard became the first to cross the English Channel on a hot air balloon in 1785. In 1932, Auguste Piccard became the first person to reach the stratosphere in a balloon (that’s 52,498 feet!). As technology continued to improve, more extreme trips became possible. In the 1980s, there were multiple transatlantic crossings, the first in hot air balloon history. One of the biggest achievements in hot air balloon history was in 1999. 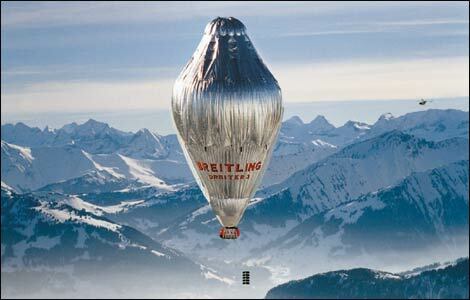 Bertrand Piccard and Brian Jones became the first people to fly around the world on a hot air balloon in just 19 days. With the invention of airplanes and helicopters, hot air balloons might not be the most popular form of transportation anymore. But they create the same joy and wonder today that they did when the Montpelier brothers first flew in the 1700s. Hopefully, you learned something about the interesting history of hot air balloons! If you’re looking to experience a hot air balloon ride or want to know more about balloon travel, feel free to contact us!